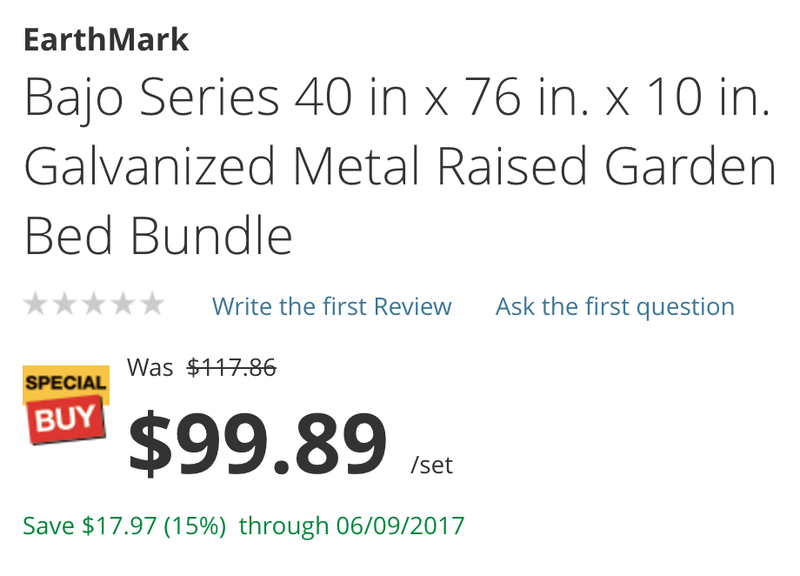 Home Depot offers the Bajo Series 40- x 76- x 10-inch Galvanized Metal Raised Garden Bed for $99.89 shipped. For comparison, it usually goes for $150 or more at most online retailers. Today’s deal is the best offer that we can find. It’s starting to warm up outside, so you need to begin thinking about your garden. These raised beds are perfect for herbs or vegetables and the metal frame will help prevent deterioration. EarthMark products generally receive solid ratings at Home Depot. EarthMark metal raised garden beds are a perfect blend of style and function. Our raised beds are made from hot-dip galvanized steel that will not warp, crack, or rot and can be recycled at the end of their service life. Our beds come in Low (10 in.) or High (17 in.) sidewalls to accommodate different types of plants. This bundle includes all parts needed to make a LOW (10 in.) x 40 in. x 76 in. rectangle bed. The set includes a 40 in. x 40 in. bed and 1 extension set that will arrive in a single shipping carton. Beds can be joined end-to-end or use freestanding to create a classic raised bed garden. EarthMark beds have been designed with ergonomics in mind, 40 in. wide beds provide 2-sided access without needing to step in the bed, keeping the soil loose and eliminating the need to till the soil each year. You will be amazed at the added productivity, accessibility and convenience of growing more with less soil and space. EarthMark planters and beds make estate quality gardens easy and affordable for all.